"The building’s façade unites brick and stone with oversized windows outside, while gracious interior layouts incorporate the latest appliances and finest luxury finishes, with coveted on-site amenities." 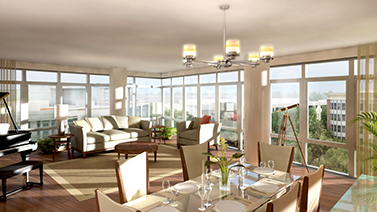 At the corner of Bethesda and Woodmont Avenue, The Darcy is a boutique condo located in the very heart of everything. Residences range from an 835 sq ft one bedroom, one bath unit to a penthouse with three bedrooms and three-and-a-half baths in almost 3000 sq ft. Many of the units face west or southwest to provide amazing sunset views. The Darcy's 24/7 front desk concierge provides a variety of a la carte services for residents such as dog walking, gift shopping, housekeeping, flower delivery, grocery shopping, plant care and event ticket services. The building also houses two hospitality suites for residents, a fitness center, a business center, and a residents' lounge. The second level features a clubroom with a fireplace and a balcony as well as a catering kitchen with an espresso maker. Each unit comes with a parking space and buyers can purchase storage space. Residents of the Darcy can also access the rooftop terrace of the Flats across the street. Ground floor tenants at the buildings will include Silver (the new upscale concept from Silver Diner), Paul Bakery, Chop't, Pottery Barn and Passion Fish. Step outside your door into the dynamic neighborhood of downtown Bethesda and the restaurants and shops of famous Bethesda Row. Recognized as one of America’s most livable cities, Bethesda offers a unique and privileged lifestyle in the D.C. metro area. The Darcy is adjacent to the Capitol Crescent Trail, prized for walking, jogging and biking. Restaurants a walk away include Mon Ami Gabi, Jaleo, Raku and Tandoori Nights. The Bethesda Row movie theater and a Barnes & Noble bookstore are across the street; nearby are a Regal Cinemas, the Bethesda Blues & Jazz Supper Club and the Roundhouse Theatre. Several art galleries are also within walking distance. Recognized as one of America’s most livable cities, Bethesda offers a unique and privileged lifestyle in the D.C. metro area. Some of Bethesda's famed restaurants and shops surround you. Nearby, you can access to the Capital Crescent Trail, an off-road trail suitable for walkers, joggers, bikers, and rollerbladers which runs from Georgetown in D.C. to Silver Spring, MD. The Bethesda Metro station, with service into Washington, DC, is also just a few blocks from your home.